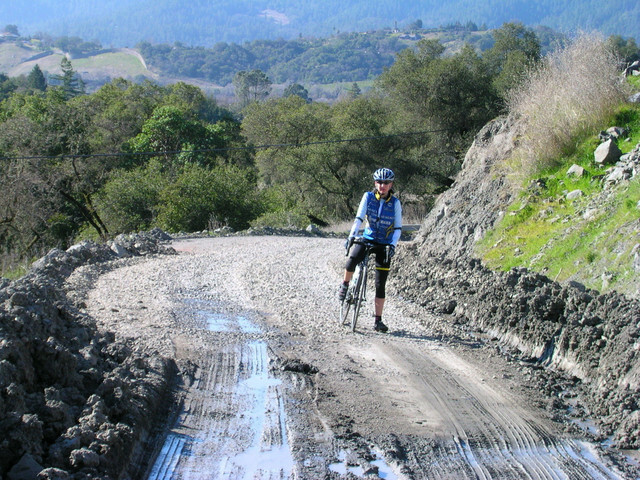 This challenging and remote ride heads north from Healdsburg along the vineyards of the Alexander Valley to the town of Cloverdale. 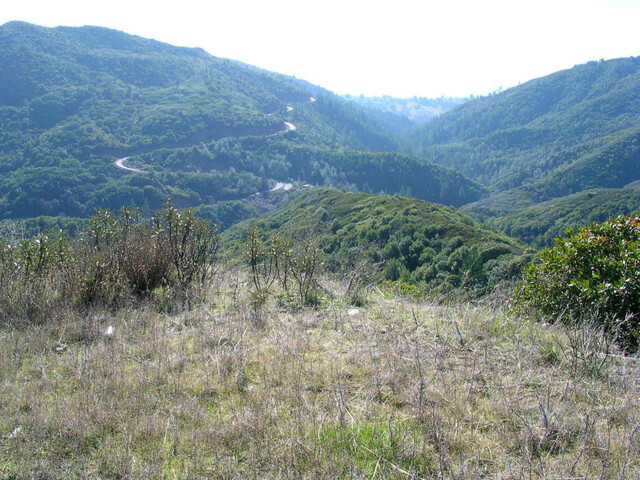 Here you'll head east and follow Big Sulfur Creek, climbing for almost 14 miles to the first summit, into the heart of the Mayacamas Mountains. 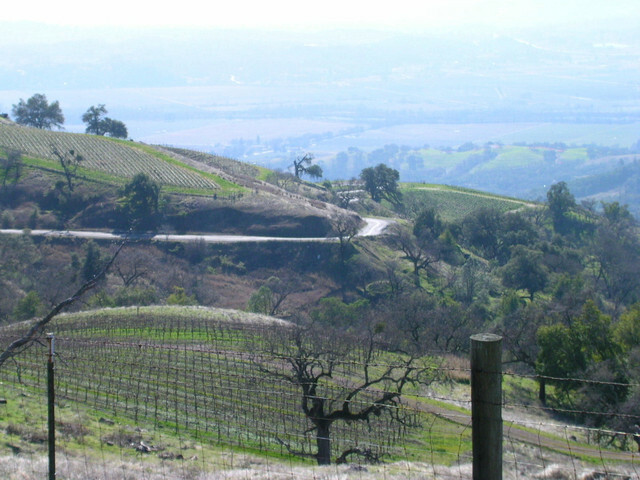 You'll eventually finish with a spectacular dive back into the Wine Country. Not for the unfit or faint of heart- adventure guaranteed. Great for visiting advanced level bike groups. WE RECOMMEND LEAVING EARLY AS TEMPERATURE AND EXPOSURE ARE FACTORS ON THIS ROUTE. Take a look at the map for info on SUMMITS, GRADES and areas to use EXTREME CAUTION. We rent Carbon Road bikes- appropriate gearing- $85.00/day. 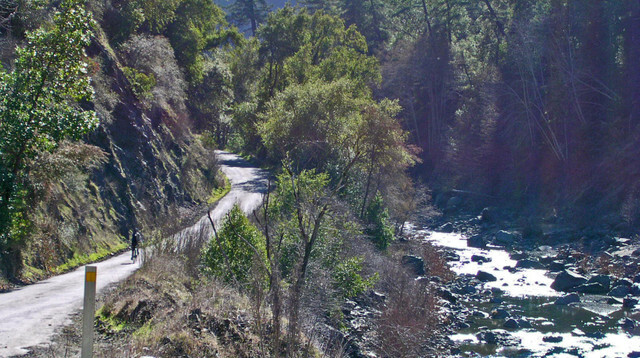 # Roll through a narrow canyon that snakes upward through some of the most rugged, spectacular landscape Nor Cal has to offer. Panoramic vistas high above So Co wine regions.Take the challenge then reward your efforts with some of the best craft brews and artisan wines of the area. **We suggest you [follow this link on your phone to create a free Ride With GPS account and automatically become a member of the Wine Country Bikes RWGPS Club](http://ridewithgps.com/auto_approve/Club/152/syFZi8zSatgzjqds). Installing their free app will then allow you to use turn by turn voice navigation on any Wine Country Bikes routes and download our routes and maps to your phone for offline usage. 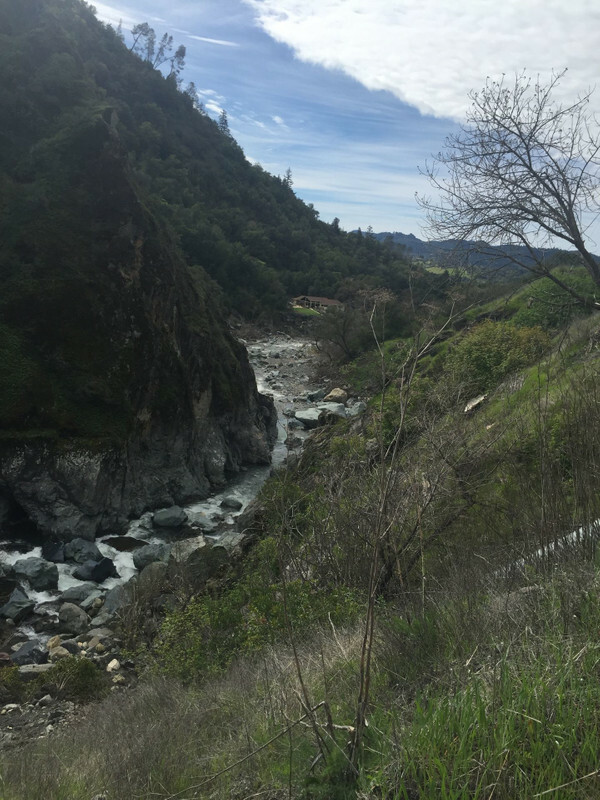 From our @poi[Bike Touring Center](1753509) in the Town of Healdsburg the route starts with about 20 miles of mostly flat riding, along the vineyards of the Alexander Valley, north to the town of Cloverdale. 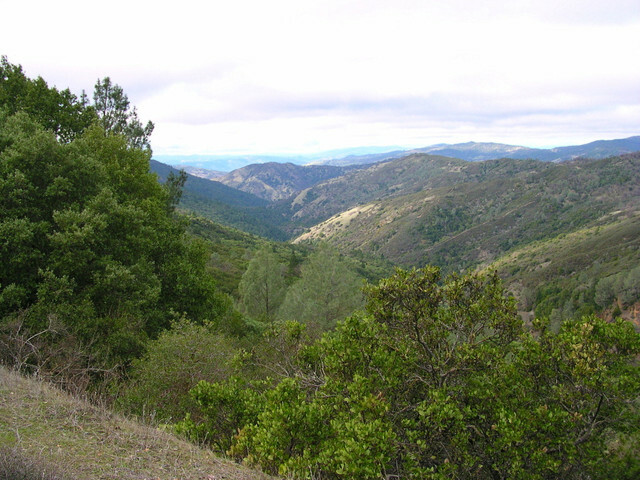 Here you'll head directly east into the Mayacamas mountain range. 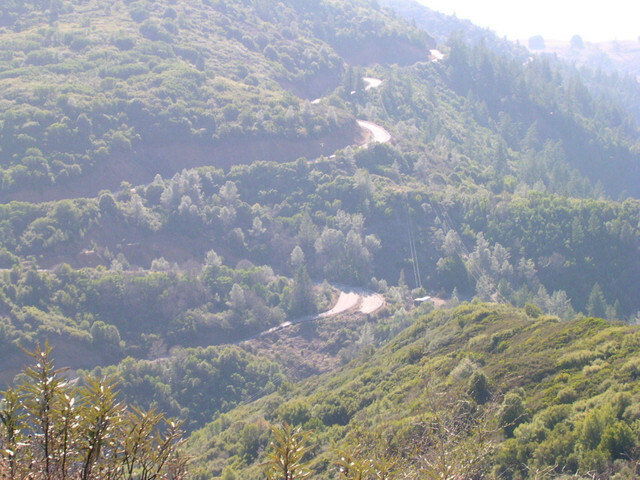 The Geysers loop has two main climbs. The main section of the @slice[first climb](d,34276.79,57441.85), approximately 14 miles with varying grades, offers the first challenge or perhaps you may have already been challenged by a @slice[north head wind](d,8867.69,29014.27) up to Cloverdale (LOL). The@slice[ second climb](d,61590.83,63475.98), only 1.5 miles but with a few good pitches, will most likely zap any little bit of kick you had left in your legs! The Geyser's road is lightly traveled as you enter the canyon. Initially you'll encounter a @slice[few hundred yard section of dirt and gravel](d,33090.16,33378.22) which is often strewn with rocks and debris. 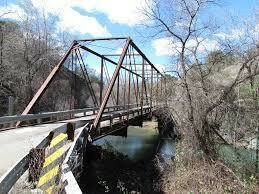 You'll continue on a winding, rough road high above Big Sulfur Creek in the canyon. After about 9 miles of rolling upwards you’ll pass a @poi[Geo Thermal Field](9428117), one of the largest in the world. As well, you'll cross the creek on @poi[historic Geysers Bridge](1755983) and begin a steady 4.5 miles of moderate climbing(3-6%), continuing along the canyon. The kicker comes when the road turns away from the creek, past the old Geysers Resort Road and @slice[climbs steeply (10-16%)for 1.5 miles to the shoulder of Geyser Peak](d,53473.42,55958.73) at 2650 feet. You continue south wrapping around the ridge, passing the old quicksilver town of @poi[Mercuryville](1753489), before swooping down on a quick decent to the bridge over Little Sulfur Creek. 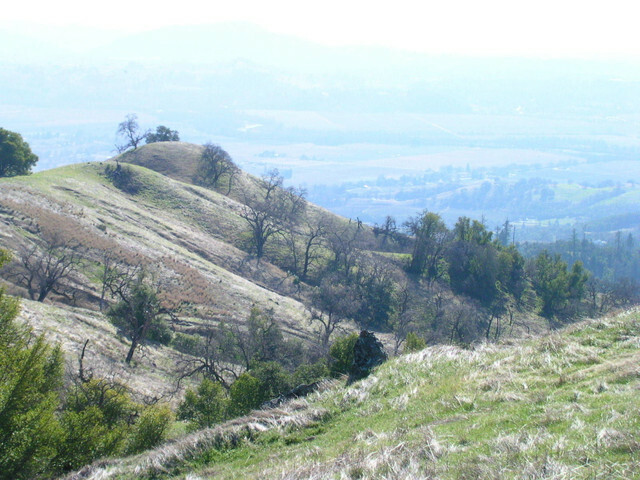 The @slice[second climb is 400+ feet](d,61515.81,63322.11) out of the gulch and brings you to the ridge above Alexander Valley with spectacular views of Northern Sonoma County from the Coastal Range through Knights Valley to Mount St. Helena. The descent is a long twisting and spectacular dive from the rugged cattle ranches in the mountains to the beautifully groomed vineyards of the valley. But use caution and control your speed! There are is a @slice[short section of gravel](d,69082.45,69554.91) and some cracks and holes on the descent! 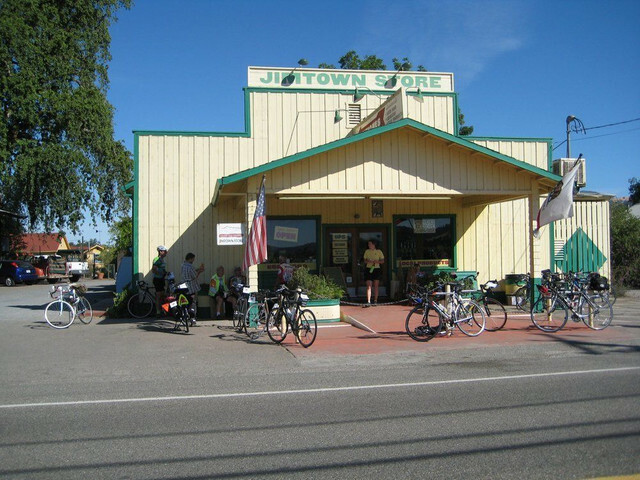 It’s just another 10 miles of flat cruising to flush out your legs with, maybe, a short stop at the @poi[Jimtown Store](1753490) for a cold drink or snack and you’re back in Healdsburg again. # More resources ## **We also have Garmin GPS units for rent at $20.00 for 1 day and $5.00/each additional day. ** * Please contact [Wine Country Bikes](http://winecountrybikes.com)- for more information on bike rentals & tours from the Town of Healdsburg in northern Sonoma County California. For this ride you will want to use a [high quality carbon fiber or aluminum Road Bike. ](http://www.winecountrybikes.com/bike-rentals/#trekdomane45roadbikes) * [Geyser Geothermal Field Video](https://vimeo.com/58388803) * [Historic Geysers Bridge](http://historicbridges.org/bridges/browser/?bridgebrowser=california/geysersroad/) * [Jimtown Store](https://www.jimtown.com/) # Important Reminders ***SIGNIFICANT PORTIONS OF THIS ROUTE ARE REMOTE WITHOUT CELL PHONE COVERAGE AND NO ACCESS TO WATER***** ***Geysers Road is narrow and in sections one lane and road conditions are poor with gravel and rocks in the road. Pavement is cracked and separated in many places due to regular seismic activity in the area. The traffic level is low, but there can be cars! *** ***The micro climate in the Geysers area can be much hotter than the surrounding valleys in the summer. Bring extra water! 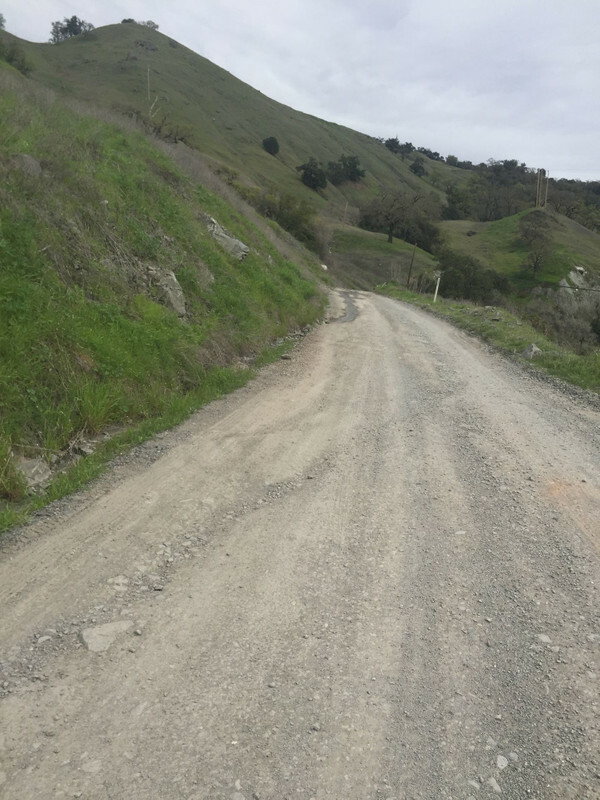 *** Traffic on Alexander Valley Road can be heavy and the road is narrow. Use caution.